Russian baths - a bathhouse with a steam room where heat comes from heated stones and humidity is added by throwing water on the stones. A vital part of banya is venik - a leafy bundle of birch or oak twigs used for body platza. 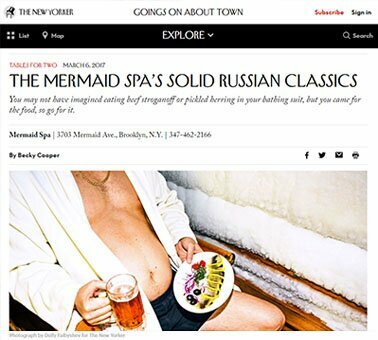 Mermaid Spa located in the Sea Gate area of Brooklyn has a reputation for being the best Russian baths in New York..
Dear Valued Customers! Starting January 1st, 2019 the following prices will be in effect. Admission fee for adults - $50.00, Admission fee for senior citizens - $40.00, Admission fee for children - $45.00. Dear guests, starting December 1st 2018 no outside alcoholic beverages are allowed. In other words, starting this December you can no longer bring your own alcohol to our spa. Our bania has reopened after the extensive beautification and renovation! Now you can enjoy your summer even more with our renovated backyard and the outdoor smoking area. We also expanded our lobby, added the pool room, made the ice room bigger and our interiors design even cozier with the birch hallway. Our massage services and new massage room are also there for you, so you can relax even more at our spa. Also, we made the permanent entrance enclosure to keep your even warmer during the winter. Mermaid Spa located in the Sea Gate area of Brooklyn has a reputation for being the best Russian baths in New York. Besides three Russian steam rooms, this bathhouse has a scorching dry sauna, a Turkish bath, two tile pools that are machine-fed with chopped ice and a circular Jacuzzi inside a lodge-like wooden hall. The entire facility is finished with wood and slate. 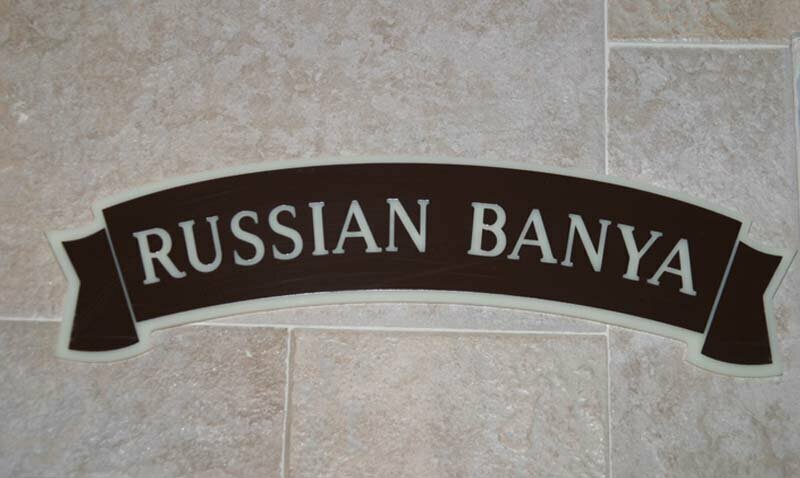 Owners Zina and Boris Kotlyar, Joseph Feldsherov say they wanted to create an environment that was similar to an old style banya in Russia. "Marble is so cold, wood helps you feel warmer." The great quality of steam also helps to feel warmer. Mermaid Spa also offers Russian platza with soap or venik - a leafy bundle of birch or oak twigs. Children below 50 inches in height are not permitted to use our facility. 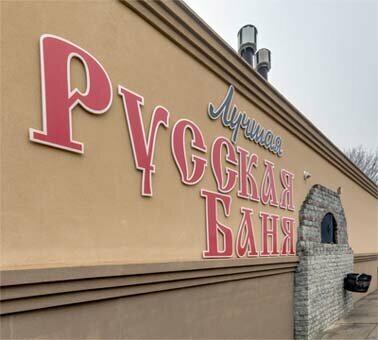 The restaurant is great with authentic Russian dishes that you would not want to miss. Traditional Russian vodka, cold beer and freshly squeezed juices are also available. The resting area is cozy. 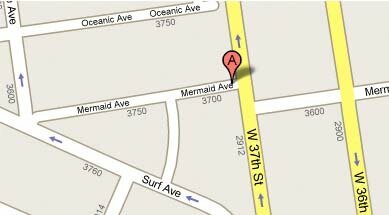 In the summer visitors appreciate the fact that Mermaid Spa is located just a 5-minute walk to the beach. "Sweat. So much sweat. I was sitting in one of several sauna rooms available at the Mermaid Spa, the luxurious Russian bathhouse in Coney Island, and wondering whether my eyebrows were going to spontaneously combust. That’s when the guy standing up on the higher bench behind me — an even hotter place to be — started slapping himself vigorously with a wet bundle of leaves... There are various ways to sweat at the Mermaid Spa, including three wood-paneled Russian steam rooms, a tile-lined Turkish bath, a Russian dry sauna with large, exposed stones emitting heat, and a big hot tub. There are several ways to cool down between the scorchings, as well. When I called Boris Kotlyar, the owner, a few days after our visit, he told me he has owned the Mermaid Spa for nearly 20 years. The place had a disastrous fire in 2006. “We were closed for three years,” he said, “basically rebuilding from the scratch.” During Hurricane Sandy in 2012, just a few inches of water damaged some equipment, but the structure was left intact. “We were lucky,” he said. “After the fire, we deserved lucky.”Each room is different, he told me: The Turkish sauna is just 120 degrees but has nearly 100 percent humidity. The less moist sauna rooms are maintained at temperatures of 150, 165 and 180 degrees. “They are all different in temperature and humidity,” he told me, “but basically the final effect is to get sweated. That’s what it comes to.”"
"The smell of chlorine emanating from the concrete building is the first hint that Mermaid Spa, in Coney Island, isn’t Spa Castle. There are no crystal rooms, no “color therapy” experiences, and, thankfully, no uniforms reminiscent of a totalitarian regime. This is a Ukrainian-Russian community center, a blustery twenty-minute walk from the subway, as traditional as banyas get in New York City, with a clientele that takes its sweating very seriously. There is, happily, also a restaurant, which serves some solid Russian classics. The dining room, guarded by golden mermaids, is built around a hot tub. There are older men in groups; younger, shiny men in groups; and fit couples throwing back plastic pints of beer. Everyone is wearing towels, and most are in felt hats that, counterintuitively, help with the heat. Claim a table — it’s yours for the day — and head into the sauna. Sweat until you can’t stand it, and escape to the cold shower. Pull the chain and a torrent of ice water rushes over you. Then go to the steam room and get lost in the fog, before plunging into the ice pools. Jump out, gasp for breath, and feel your head pound with shock and relief. Repeat until you’re jelly, and then it’s time to eat. Many tables stick with giant bottles of water and platters of fresh fruit. But you came for the food, so go for it. The large meat dishes — lamb leg, beef stroganoff, chicken tabaka — are hefty in a way that seems ill-advised in the setting. The hot appetizers are a better idea. 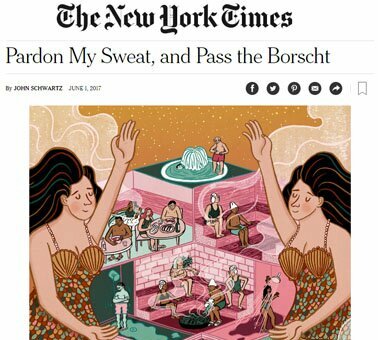 The borscht is rich and thick. The garlicky French fries, piled on a sizzling iron skillet, though not exactly what you’d picture eating in a bathing suit, are a banya staple. Even more traditional are the pelmeni, filled with beef, lamb, and veal, and topped with mushroom gravy, which are addictive until they congeal at room temperature. Luckily, the dish is too good to leave for long. The best, though, are the cold appetizers, especially the pickled herring or, if you dare, the salo — raw pig lard, frozen and sliced thin. The procedure is half the fun: Layer it over some brown bread. Salt it. Pick up a raw garlic clove. Salt that. Bite one, then the other. The sharp fire of the raw garlic gives way to the sweetness of the bread, and to the soothing fat as it melts. It’s more bracing than the ice pools. On the way out, do yourself a favor and stop by the beach, whose winter charm doesn’t get enough credit. The steam rises off your skin. The coastline extends as far as you can see, populated by no one. What a gift the quiet is. (Spa entrance $45; dishes $4-$30.)" The Birch Room is finished with Birch Trunks and Cedar Boards. The combination of Birch and Cedar exudes unique aromas creating a relaxed and pleasant atmosphere. The Birch Room is integrated into a large resting area and is only a few feet away from all Banyas, Steam Room, Plunge Pools and Whirlpool, yet still provides privacy for your group. It has its own air conditioning and independently operated TV. The Birch Room can accommodate up to 13 people and is offered in 5 hour time slots only (8:00 am – 1:00 pm; 1:15 pm – 6:15 pm; and 6:30 pm – 9:00 pm) for the price of $650.00 per five hour slot. It can be reserved in advance for a $200.00 refundable deposit. The deposit can be refunded provided that the reservation is canceled within 24 hours prior to the scheduled reservation. An authentic Russian room with a stove made with granite rocks heated overnight to radiate intense heat. The stove has a hole to throw the water into. By throwing water on stones heated to extreme temperatures behind metal doors, steam droplets of exceptionally small size are created; this makes breathing easy and enjoyable. The temperatures usually do not exceed 80C/180F. Here people often hit themselves or others with bunches of dried branches and leaves from white birch or other suitable trees (called venik) in order to get a message and improve the circulation. In winter, branches that have been dried and then moistened in hot water are used. Felt hats are used to protect the head from heat. Pads are used to sit on as the hot, dry wood can be uncomfortable for bare skin. A real wooden Finish sauna with dry heat (low humidity) and a constant 200F temperature. Finer control over the temperature experienced can be achieved by choosing a higher level bench for those wishing a hotter experience or a lower level bench for a more moderate temperature. This steam room offers the added health benefit of steam inhalation. Fresh eucalyptus and mint are added to the steam. Mermaid Spa’s circular Jacuzzi is one of the biggest in New York. It’s located inside a lodge-like wooden hall. Two tile pools are machine-fed with chopped ice. A perfect place to sit and rest after a visit to the steam room. Traditional Russian platza inside of a steam room with soap and venik (a leafy bundle) is available. The restaurant has authentic Russian dishes that you would not want to miss. Traditional Russian vodka, cold beer and freshly squeezed juices are also available. The dining area is cozy. DRINKS Sparkling and Mineral Water, Tea. Prices for other services and packages stay the same, no increases. Also, please Notice! According to our Certificate of Occupancy by the Department of Buildings of New York our last admission time is 8:00pm sharp. After 8:00pm no admission to our Banya will be allowed. 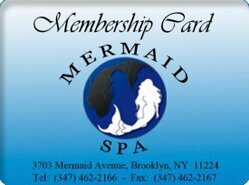 We are continuing our efforts to make Mermaid Spa ever more convenient and accommodating. Starting at the end of April and trough the end of July we will be renovating our banya. Mermaid Spa will remain open for the duration of this work. We may be closed just for a few days, but not more than that. Our goals for this renovation are to add an isolated and ventilated smoking room that will have heated floor. We will add more beach beds, chairs and tables to our backyard. Additionally, we will expand our reception area and add a new massage room. 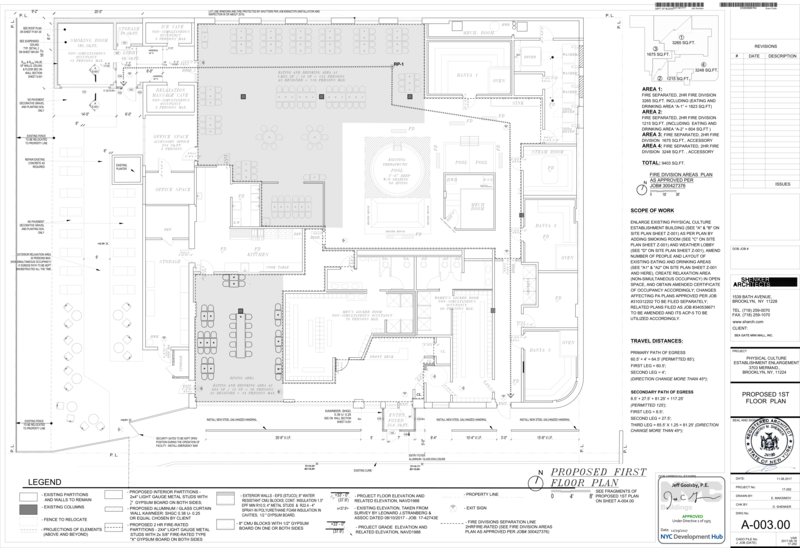 You can review an architectural drawing below. Starting April 10, 2018 our parking lot won't be available to our customers. This is a temporarily situation caused by main gate of Seagate known as Surf Avenue Gate being repaired. Because it's being repaired, Seagate Association forced us to allow the use of the second gate that happened to be behind our parking lot by its residents hence making our parking lot a drive-through. We are sorry for this inconvenience. We will make an announcement as soon as this repair work is done and our parking situation is back to normal. We thank our customers for their patience and understanding. Veterans, active duty service members and their spouses enjoy 5.00 dollars off on entrance fee, plus 10% discount on restaurant bill. To claim discounts veterans, service members and spouses required to present the proper photo ID. 1) Salad, Split Pea Soup, Meat Ravioli, Fruit Punch. 2) Salad, Mushroom soup, Bas s Fillet, Fruit Punch. 3) Salad, Borsch, Chicken Patty, Fruit Punch. You can also purchase Gift Certificate. 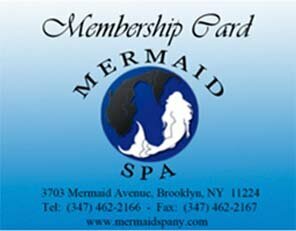 This Gift Certificate can be used to cover admission fees, food, drinks and any services offered at Mermaid Spa. It can also be used towards a purchase of our Membership packages. If you purchase a membership for someone else or a Gift Certificate that is going to be used to obtain a membership, please give the name of this person to our receptionist. Memberships can only be used by registered members and are not transferable. - We reserve the right to refuse admission and service at this establishment to anyone at our own discretion. - Photos taking or video recordings are not allowed. Violators will be forced to leave the facility without any refunds. - No smoking including electronic cigarettes allowed on the premises. Smoking is permitted only in open designated area indicated by the "SMOKING AREA" signs. - Children under the age of 12 are not allowed in the pools without adult supervision. - Warning. You are entering saunas and bathing facility area on your own risk! Always be aware of wet floors use only anti-slip footwear. Always be aware of hot ovens in saunas and steam rooms. 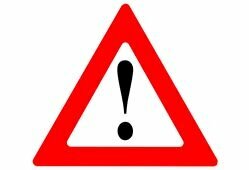 Always adhere to all posted warning signs. - All sales final no refunds no returns. - Do not lose Your keys!!! The charge for the lost keys is 25.00 dollars. - No food from outside is allowed (except fruits and vegetables). Attention: guests who brought food from outside fruits, vegetables and any drinks will be charged $1.50 per person for our disposables tableware and following cleanup. - We are not responsible for any valuables left unattended. We do not examine video surveillance recordings in search for valuables left unattended. - We are not responsible for jewelry, watches, cash and electronics left at front desk storage. - Our 45.00 dollar entrance fee covers the cost of a single seat & full use of the facility. Seats are sold on a first come first serve basis. We reserve the right to sit patrons in any available seat. We reserve the right to move seated patrons at our own discretion. - No glass allowed (including glass bottles). - In our saunas (banyas) you can only use aromatherapy essential oils that you bought at our front desk. - Only our attendants can use water buckets in the steam rooms. - Children below 50 inches in height are not permitted to use our facility. Monday - Friday: 8:00ам - 9:00pm. Saturday - Sunday: 7:00ам - 10:00pm. Our last admission is at 8:00pm on any given day. Near Sea Gate community. Do not enter Sea Gate's main entrance, go around, from Surf Avenue make a right and within 150 feet you should see our black gate. Subway: last stop on D, F, N, Q - Coney Island / Stillwell Avenue. Bus: stop Sea Gate - B 36, B 74. © Copyright 2009 - Mermaid SPA. All rights reserved. Usage of any website’s materials, either graphical or written, is prohibited.